Our long experience in ships work guarantees that every task great or small, will be dealt quickly and within the plan and time agreed upon. 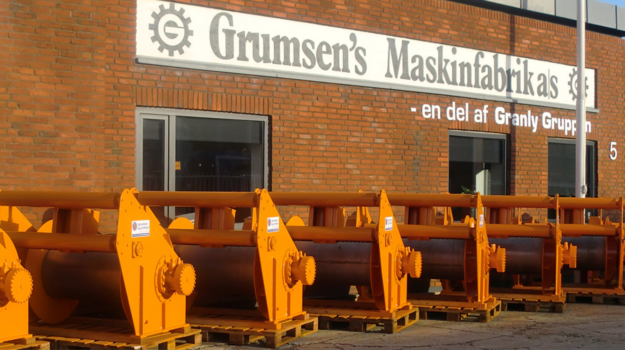 Grumsen Equipment has 70 years of experience in servicing cargo boats, off-shore installations and fishing vessels, and the company works in facilities located at Esbjerg harbor. The factory covers an area of more than 4500 square meters, and the total workshop area covers 10200 square meters. The company has the necessary capacity as well as the appropriate machinery and technical know-how to comply with extensive reconstruction, engine replacement and marine repairs. The company offers turn-key contracts for major tasks within these fields. Grumsen Equipment has a winch production that includes a wide selection of standard winches and other deck machinery. The company also constructs special winches and complete winch systems according to the customers specifications and special needs. The machining tools at Grumsen Equipment are not only intended for the company’s own production. They are in high demand in connection with difficult processing tasks as well as in work involving heavy, extensive units. For example the company owns a lathe, which can manage units up to 2.5 meters in diameter, lengths of up to 4 meters and a weight of 20 tons. An increasing number of companies contract for use of machinery hours at Grumsen Equipment when they need to deal with tasks beyond the capacity of their own machinery. It is an important advantage for the customer that Grumsen Equipment calculates and constructs complete winch systems and in most cases also installs total systems and delivers them in smooth running order.